Joyce Meyer will help you use the Word to overcome the battles of your mind by changing your thoughts to change your life. Features she shares include over 150 contemplative articles on Winning the Battles of the Mind, 500 scripture-based articles called Keys to a Victorious Life, and so much more. She also helps empower you with God’s strength through hundreds of prayers, thought-provoking questions, and thorough introductions to each book of the Bible. Joyce’s teachings on the “Battlefield of the Mind” give a new dimension to how the “Words of life” can transform your life. You’ll feel as though you have Joyce as your own personal study partner. 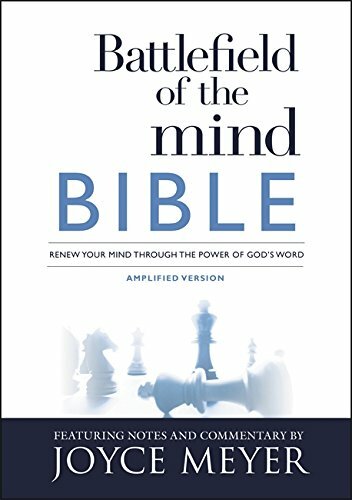 *PowerPoints – Approximately 350 powerful tips drawn from scripture to help you think, speak, or live to win the battles of the mind. *Speak God’s Word – 300 scripture confessions that will teach you how to confess God’s Word for yourself. *A Prayer for Victory – 125 prayers to fuel your ability to overcome any obstacle and live victoriously.